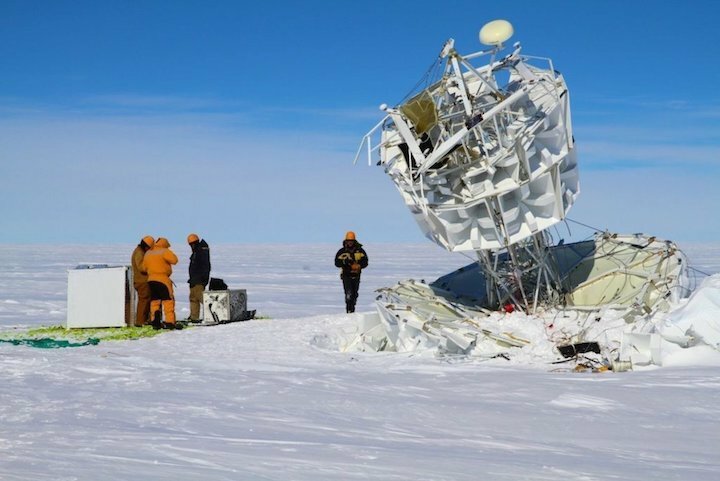 A team recovers NASA's Antarctic Impulsive Transient Antenna (ANITA) after a successful flight. There's something mysterious coming up from the frozen ground in Antarctica, and it could break physics as we know it. Physicists don't know what it is exactly. But they do know it's some sort of cosmic ray — a high-energy particle that's blasted its way through space, into the Earth, and back out again. But the particles physicists know about — the collection of particles that make up what scientists call the Standard Model (SM) of particle physics — shouldn't be able to do that. Sure, there are low-energy neutrinos that can pierce through miles upon miles of rock unaffected. But high-energy neutrinos, as well as other high-energy particles, have "large cross-sections." That means that they'll almost always crash into something soon after zipping into the Earth and never make it out the other side. And yet, since March 2016, researchers have been puzzling over two events in Antarctica where cosmic rays did burst out from the Earth, and were detected by NASA's Antarctic Impulsive Transient Antenna (ANITA) — a balloon-borne antenna drifting over the southern continent. ANITA is designed to hunt cosmic rays from outer space, so the high-energy neutrino community was buzzing with excitement when the instrument detected particles that seemed to be blasting up from Earth instead of zooming down from space. Because cosmic rays shouldn't do that, scientists began to wonder whether these mysterious beams are made of particles never seen before. All the explanations were intriguing, and suggested that ANITA might have detected a particle not accounted for in the Standard Model. But none of the explanations demonstrated conclusively that something more ordinary couldn't have caused the signal at ANITA. "I was like, 'Well this model doesn't make much sense,'" Fox told Live Science, "but the [ANITA] result is very intriguing, so I started checking up on it. I started talking to my office neighbor Steinn Sigurdsson [the second author on the paper, who is also at Penn State] about whether maybe we could gin up some more plausible explanations than the papers that have been published to date." Fox, Sigurdsson and their colleagues started looking for similar events in data collected by other detectors. When they came across possible upward-going events in IceCube data, he said, he realized that he might have come across something really game-changing for physics. The surface facility for the IceCube experiment, which is located under nearly 1 mile (1.6 kilometers) of ice in Antarctica. IceCube suggests ghostly neutrinos don't exist, but a new experiment says they do. "That's what really got me going, and looking at the ANITA events with the utmost seriousness," he said, later adding, "This is what physicists live for. Breaking models, setting new constraints [on reality], learning things about the universe we didn't know." As Live Science has previously reported, experimental, high-energy particle physics has been at a standstill for the last several years. When the 17-mile (27 kilometers), $10 billion Large Hadron Collider (LHC) was completed on the border between France and Switzerland in 2009, scientists thought it would unlock the mysteries of supersymmetry — the mysterious, theoretical class of particles that scientists suspect might exist outside of current physics, but had never detected. According to supersymmetry, every existing particle in the Standard Model has a supersymmetric partner. Researchers suspect these partners exist because the masses of known particles are out of wack — not symmetric with one another. "Even though the SM works very well in explaining a plethora of phenomena, it still has many handicaps," said Seyda Ipek, a particle physicist at UC Irvine, who was not involved in the current research. "For example, it cannot account for the existence of dark matter, [explain mathematical weirdness in] neutrino masses, or the matter-antimatter asymmetry of the universe." "We need new ideas," Jessie Shelton, a theoretical physicist at the University of Illinois at Urbana-Champaign, told Live Science in May, around the same time that Fox first became interested in the ANITA data. "It was clear from the start that if the ANITA anomalous events are due to particles that had propagated through thousands of kilometers of Earth, then those particles were very likely not SM particles," said Mauricio Bustamante, an astrophysicist at the Niels Bohr Institute at the University of Copenhagen, who was not an author on the new paper. "The paper that appeared today is the first systematic calculation of how unlikely is that these events were due to SM neutrinos," he added. "Their result strongly disfavors a SM explanation." "I think it's very compelling," said Bill Louis, a neutrino physicist at Los Alamos National Laboratory who was not involved in the paper and has been following research into the ANITA events for several months. But neutrinos of this energy, Louis said, just shouldn't make it through the Earth often enough for ANITA or IceCube to detect. It's not how they work. But neutrino detectors like ANITA and IceCube don't detect neutrinos directly. Instead, they detect the particles that neutrinos decay into after smashing into Earth's atmosphere or Antarctic ice. And there are other events that can generate those particles, triggering the detectors. This paper strongly suggests that those events may be due to physics beyond the standard model, Louis said, though he added that more data is necessary. Louis said that at this stage he thinks that level of specificity is "a bit of a stretch." The authors make a strong statistical case that no conventional particle would be likely to travel through the Earth in this way, he said, but there isn't yet enough data to be certain. And there's certainly not enough that they could definitively figure out what particle made the trip. "As an observer, there's no way that I can know that this is a stau," he said. "From my perspective, I go trawling around trying to discover new things about the universe, I come upon some really bizarre phenomenon, and then with my colleagues, we do a little literature search to see if anybody has ever thought that this might happen. And then if we find papers in the literature, including one from 14 years ago that predict something just like this phenomenon, then that gets really high weight from me." But there remains a lot of uncertainty on that front, he said. Right now, researchers just know that whatever this particle is, it interacts very weakly with other particles, or else it would have never survived the trip through the planet's dense mass. Every physicist who spoke with Live Science agreed that researchers need to collect more data to verify that ANITA and IceCube have cracked supersymmetry. It's possible, Fox said, that when IceCube researchers dig into their data archives they'll find more, similar events that had previously gone unnoticed. Louis and Bustamante both said that NASA should run more ANITA flights to see if similar upward-going particles turn up. "For us to be certain that these events are not due to unknown unknowns — say, unmapped properties of the Antarctic ice — we would like other instruments to also detect these sort of events," Bustamante said. A team prepares ANITA for flight over the Antarctic ice. "Any observation a non-SM particle would be a game changer, because it would tell us which path we should take after the SM," Ipek said. "The type of [supersymmetric] particle they claim to have produced the signals of, sleptons, are very hard to produce and detect at LHC." "So, it is very interesting if they can be observed by other types of experiments. Of course, if this is true, then we will expect a ladder of other [supersymmetric] particles to be observed at the LHC, which would be a complementary test of the claims." Right now, Fox said, he's just hungry for more data. NASA went searching for micro black holes in Antarctica. Instead, it detected cosmic rays shooting from the ground and some physicists think it could be evidence of a supersymmetric particle. There’s something strange happening beneath the surface of Antarctica and it’s got nothing to do with Nazi UFOs. Rather, researchers are arguing that a decade-old experiment may have furnished the first evidence of a new type of particle that has evaded detection by some of the most sophisticated particle accelerators for years. If they turn out to be correct, it would change physics as we know it. 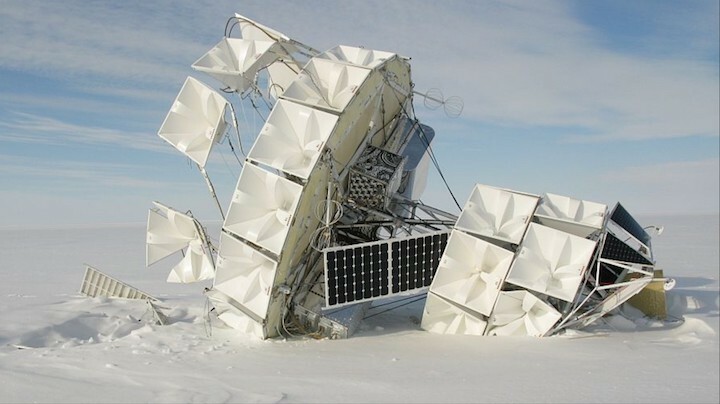 In 2006, NASA-affiliated researchers launched Antarctic Impulsive Transient Antenna (ANITA), a balloon experiment meant to observe high energy particles that shower the Earth from space, also known as cosmic rays. During ANITA’s flight, however, its instruments observed something that physicists couldn’t explain. In addition to detecting cosmic rays from space, ANITA also detected cosmic rays shooting from the ground as the high altitude balloon drifted over the Antarctic ice sheet. Physicists have long known that high energy particles can penetrate deep into Earth, but none of the particles predicted by the Standard Model—the most accurate model of physics that has ever existed—should be able to pass all the way through the planet. On Tuesday, a group of researchers led by the Pennsylvania State University physicist Derek Fox posted a new theory of these upward-shooting cosmic rays to arXivthat suggests they could be evidence of a particle that lies beyond the Standard Model. If Fox and his colleagues are correct, it would be the first evidence of a particle beyond the Standard Model of physics, the most accurate description of the universe humans have ever known. What Did ANITA See In Antarctica? The first ANITA mission launched from the McMurdo base in Antarctica in December 2006. The experiment flew to an altitude of about 120,000 feet where it spent a month drifting over Antarctica. It was equipped with sensors designed to detect pulses of radiation produced when ultra high energy neutrinos—a nearly massless particle with no electric charge—interact with the Antarctic ice sheet. In the early 60s, the Soviet physicist Gurgen Askaryan theorized that when a high energy particle interacted with a dense dielectric medium—a type of insulating material that doesn’t conduct electricity—it would produce a shower of secondary charged particles whose radiation can be detected by standard radio antennas. This interaction, now known as the Askaryan effect, allows physicists to detect particles that hardly interact with normal matter (like neutrinos) by observing their secondary effects. The goal of the ANITA mission was to use an array of antennas to detect the Askaryan radiation produced from high energy neutrinos interacting with the Antarctic ice sheet. Unlike photons, neutrinos don’t lose their energy as they propagate through the universe. This means that they can carry information from beyond the photon horizon (the limit that photon sources are still detectable from Earth) and provide a window onto the farthest reaches of the universe. Furthermore, some models of physics that are “Beyond the Standard Model” predict the existence of incredibly small extra dimensions. Some of these theories predict that when cosmic rays interact with ice this produces micro black holes that open into these dimensions, which could be detected via the Askaryan effect. Although the first ANITA mission didn’t detect any evidence of micro black holes, it did detect the Askaryan effect, the first time this had ever been observed from neutrino interactions with ice. Yet the researchers working on ANITA also got more than they bargained for when they also detected cosmic rays that appeared to be shooting out of the Antarctic ice sheet. The first ANITA mission detected two “upward-pointing cosmic ray-like events” during its month-long sojourn above Antarctica. Unlike the cosmic rays that come from space and are reflected off the Antarctic ice sheet, which produce vertically polarized pulses of radiation, the two anomalous cosmic rays had nearly horizontal planes of polarization. This suggested that they either didn’t originate in space—or if they did, the radiation was produced by particles that had traveled all the way through Earth. In either case, this type of cosmic ray had never been observed before. A second mission ANITA mission in 2009 as well as a third mission in 2014 detected another strange upward-pointing cosmic ray. The source of these cosmic rays remain a mystery, but a number of theories have been proposed. Some physicists think these upward-pointing cosmic rays are evidence of the decay of dark matter that exists in the Earth’s interior. Others have suggested that these cosmic rays can be explained with sterile neutrinos, a type of high energy particle that hardly ever interacts with ordinary matter. At first, physicists attempted to explain these strange events as the result of a type of particle called a tau-neutrino decaying as it passed through Earth. This would produce an elementary charged particle called a tau-lepton, which would produce the type of signature observed by the ANITA balloons. There was just one problem. ANITA observed the particles coming in at extreme angles—27 degrees and 35 degrees—that aren’t permitted within the Standard Model of physics. This suggested that either the Standard Model would have to undergo “significant” revisions to account for the observation—or, as Derek Fox and his colleagues recently suggested, ANITA may have observed the first evidence of a supersymmetric particle. What is Beyond the Standard Model of Physics? The Standard Model of physics was cobbled together over the course of the past century and currently serves as the most accurate model of the physical universe ever created. It describes most of the fundamental forces and classifies elementary particles. Although the Standard Model has proven remarkably successful for making experimental predictions over the last few decades, it’s not able to explain everything. Some phenomena, such as gravity, the accelerating expansion of the universe, and neutrino oscillations are not incorporated in the model. These deficiencies in the model have led some physicist to begin thinking about physics beyond the Standard Model (BSM). You may have heard of some of these exotic theories, such as string theory or M-theory, but so far there isn’t much evidence to support one theoretical version of BSM physics over another. According to the paper posted to arXiv this week, however, there are strong reasons to believe that the anomalous cosmic rays seen by ANITA could be evidence of a BSM particle. This theory relies on a version of BSM physics called supersymmetry. Unlike string theory, which is a so-called “theory of everything” that overhauls the Standard Model, supersymmetry merely extends the Standard Model by adding a new class of massive particles into the mix. In supersymmetry, each of the elementary particles in the Standard Model has a heavier “superpartner.” Thus, leptons are matched with sleptons, electrons with selectrons, quarks with squarks, and so on. None of these theoretical supersymmetric particles, or sparticles, have been produced in a lab so far, which may be because the particles require too much energy to be made by contemporary particle accelerators such as the Large Hadron Collider. Thus some physicists hope to detect them by looking to astrophysical sources, which can produce the requisite amounts of energy to produce these more massive particles. In the case of the upward-pointing cosmic rays, Fox and his colleagues argue that they are consistent with some of the predicted characteristics of the “stau,” the supersymmetric partner of the tau, which cannot be explained using the Standard Model of physics. The supersymmetric models predict that as a stau passes through Earth from space, it decays into a tau lepton and an as yet undetected lowest-mass supersymmetric particle before emerging on the other side of Earth—where the tau lepton could be registered by instruments like ANITA. To arrive at this conclusion, Fox and his colleagues first demonstrated that the events observed by ANITA are not interpretable within the Standard Model. In the first place, the trajectories of the particles are “highly improbable” under the Standard Model. As Fox and his colleagues argue, to produce these trajectories using the Standard Model would require neutrino fluxes, or the number of neutrinos hitting a certain area in a certain amount of time, “well in excess” of those that have been cataloged by various cosmic ray observatories. Furthermore, they argued that the steepness of the angles of the cosmic rays are also highly improbable within the Standard Model. Earlier this year, a team of researchers from Ohio State University’s Center for Cosmology and Astrophysics posted a paper to arxiv in which they detailed simulations of staus passing through the Earth to see if they would produce the same sort of signatures observed by ANITA when emerging on the other side. In particular, the researchers were interested in seeing whether simulations of high energy neutrinos interacting with nuclei in the Earth to create staus would reproduce the steep-angled particle trajectories detected by ANITA. Nevertheless, Connolly and her colleagues argued that searching for staus with ANITA is a promising new research direction, but she cautioned against jumping to conclusions about the significance of the anomalous events seen by ANITA. This was a conclusion echoed by Fox, who said that it is difficult to make strong claims about anomalous events based on data from only one location. If what ANITA detected was actually evidence of a supersymmetric particle, researchers would expect to see similar signatures at other neutrino laboratories. Fox said this is why most physicists were hesitant to make any claims about the anomalous events when they were first published in 2016. Fox and his colleagues took the first step in this direction by examining observations from the IceCube Neutrino Observatory in the Arctic to see if similar phenomena was hidden among the available observational data. After adjusting for differences in the IceCube detection system and ANITA, Fox and his colleagues identified three distinct events among the data that were analogous to the upward-pointing cosmic rays observed in Antarctica. For now, Fox and his colleagues’ theory is just one interpretation of the ANITA data among many, and more data analysis needs to be done. The researchers are hopeful that the data from the fourth and latest ANITA mission, which launched in 2016 and is now in its data analysis phase, might reveal more examples of these upward-pointing cosmic rays. 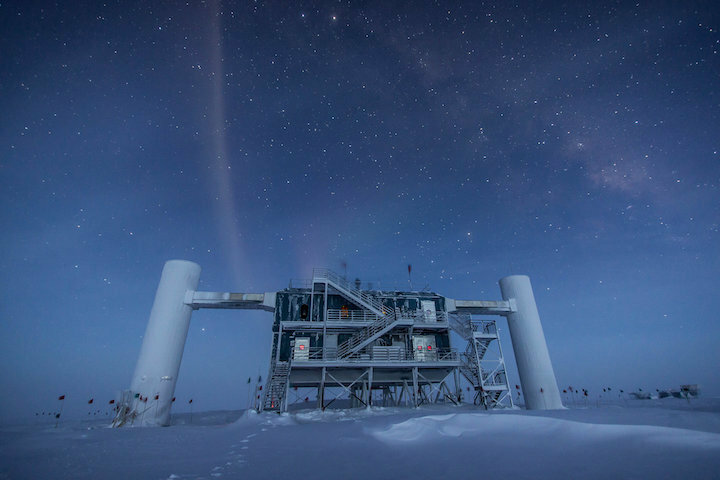 Even more tantalizing is the data from a decade of continuous observations at IceCube, which has registered far more neutrino events than all the ANITA observations combined and thus may have several upward-pointing cosmic ray events hidden among the data.